Sister Maria Stephania, Marianne Brathuhn, was the fourth child born to Johann and Elisabeth Brathuhn, née Albert. She had three sisters and three brothers. All her siblings are deceased except her youngest sister; her eldest sister died in infancy. In her family, Marianne enjoyed a happy and carefree childhood. She was popular among her siblings and playmates in the village because she was cheerful and lively. But even in Isenburg, Westerwald, where the family had meanwhile moved, people suffered from the effects of World War II. Her father was drafted for military service and returned weak and sick from the war. 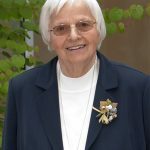 After completing basic primary and secondary school, Marianne studied home economics for two years and then came to Heinrich-Haus in Engers, where she came to know the Sisters of Notre Dame. She was trained as a nurse at Elisabeth-Hospital Neuwied. At an early age, she wanted to be a sister. After working in the orthopedic department at Heinrich-Haus, she began her postulancy on May 30, 1959. 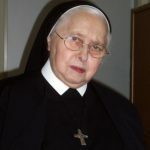 At her investment on April 16, 1960, she received the name Sister Maria Stephania. Sister Maria Stephania was a nurse through and through. For her, this profession was a ministry to which she totally dedicated herself and where nothing was too much for her. Sister could get on well with children. 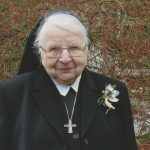 She ministered in different institutions in different places: in Duisburg-Ruhrort, Aachen, Engers, Bonn, Geldern, Mülhausen. Her kind and friendly manner was much appreciated, whether she took care of sick and elderly people, or of children, or whether she was in charge of the reception desk. 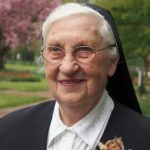 In all her different ministries, she faithfully lived her religious life. All her life long, she felt closely connected to her family – up to the third generation – by praying for their concerns. When her strength decreased, she moved to Haus Salus in Mülhausen where she could still offer some little services. But she recognized at an early stage that her mental abilities diminished and she suffered from the steady progression of her illness. She willingly accepted help from nurses and co-sisters. So they, too, reacted positively and loved having her as a patient. Although she had always been totally engaged in her service to others, she was worried about being a burden when she needed assistance herself. She was grateful for each caring and attentive gesture and she kept her sense of humor until the end. When it became obvious that her health rapidly decreased, she appreciated that a sister was with her and she loved holding her hand. In the evening of November 15, God called her home. 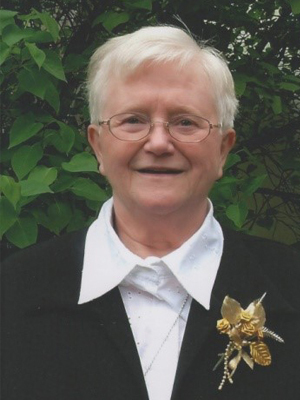 We will miss Sister Maria Stephania and we are thankful for the time we lived with her. We believe that she is now living in God’s light and eternal joy.